As legislators considered several early education bills Tuesday afternoon, testimony was dominated by a debate over what standards school districts should meet to get additional state funding for pre-kindergarten programs. During discussion of House Bill 4 — which would provide additional funding for school districts that adopt certain pre-kindergarten curriculum and teacher quality requirements — that debate primarily came down to whether the state should require districts to offer a full-day or half-day of prekindergarten. The state currently pays for half-day pre-kindergarten for students from low-income, English-language learning, military and foster families. That comes to about $800 million a year for roughly 225,000 students. In his State of the State address last month, Gov. Greg Abbott named early education one of five emergency items to be taken up immediately by the Legislature. If House budget writers get their way, HB 4, authored by state Rep. Dan Huberty, R-Houston, would add about $130 million in grants — about $1,500 per student — for districts that meet the standards it sets forth, which also include a parent involvement plan. The bill stops short of major reforms that early education proponents view as crucial to high-quality pre-kindergarten, like expanding state funding to make half-day programs full-day or limiting class sizes. But about two hours into Tuesday’s hearing, the proposal had received largely favorable testimony from witnesses who had lined up to offer their views. While Elgin Independent School District Superintendent Jodi Duron said full-day was the best approach, she added that she supported any additional state funding to pre-kindergarten. Others testifying before the panel urged lawmakers to include more money for pre-K in state funding formulas for schools instead of grants subject to the whim of the Legislature. 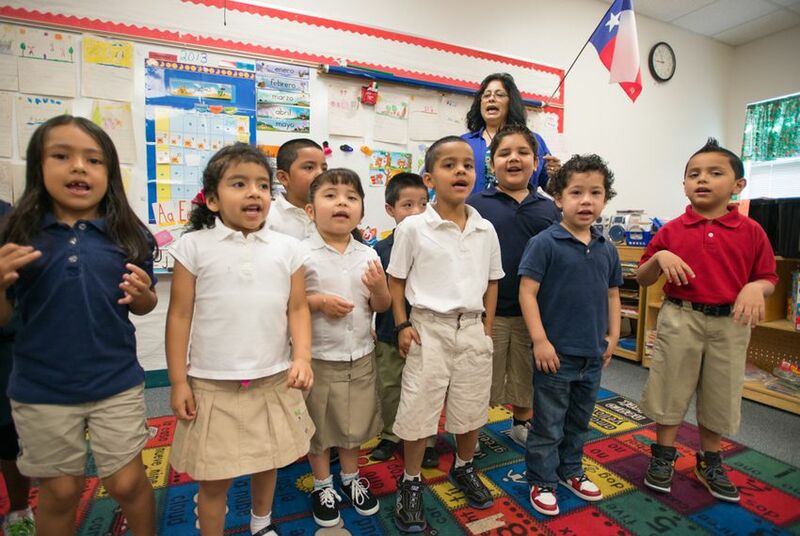 "That means you are making a real commitment to the future of pre-K," said Duncan Klussmann, the superintendent of Spring Branch ISD. "I think that is more important than the dollar amount." The hearing also addressed House Bill 1100, which makes broader changes, including requirements that districts have regular teacher training, limit class sizes and offer full-day pre-K programs to receive additional funding. It also comes with a higher price tag — at $3,600 per student, providing more than twice as much to participating districts. “We believe it’s crucial that we try to get to full-day as quickly as possible,” said state Rep. Eric Johnson, the Dallas Democrat carrying the bill along with state Rep. Marsha Farney, R-Georgetown. As testimony continued Tuesday, Huberty addressed comments from some of his colleagues pushing for full-day funding. He said there was “no doubt” that it would be ideal — but that the price tag was prohibitive. HB 173 by Carol Alvarado, D-Houston, which would require school districts to collect information on class sizes and ratios. HB 296 by Gene Wu, D-Houston, which changes quality standards for pre-K programs by capping classes at 22 students and requiring one teacher or aide for every 11 students. HB 424 by Harold Dutton, D-Houston, which expands the current pre-kindergarten system from half-day to full-day programs. HB 1188 by Joe Deshotel, D-Beaumont, which would create a temporary committee to consider consolidating early education policy under the authority of one office.